KAOHSIUNG, Taiwan – Taiwan carbon components maker Velocite is focusing on just-in-time deliveries in Europe. For presenting this service to OEMs as well as local service for the Belgian and EU markets, local technical support and training, emergency delivery capability and local spare parts availability it is opening a warehouse and inventory in Belgium. For increasing its supply chain capabilities as well as its speed to market Velocite is joining Flanders Bike Valley in Belgium. The company developed an automated filament winding process that replaces the manual, hand layup of carbon fiber patches. 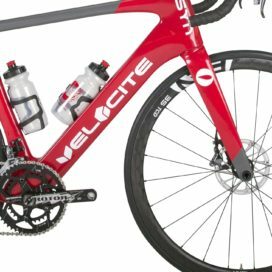 Velocite is holding a launch event at Flanders Bike Valley on the 16th of June where it will present its latest products. Velocite is also introducing Venn-branded disc brake rotors focused on road disc, cyclocross and ebike applications (not MTBs). The Venn rotors have round and smooth edges. Velocite’s CEO Victor Major presented the rotor to Mark Barfield of the UCI at last March Taipei Cycle Show. UCI will now likely mandate that road disc brake rotors that follow the Velocite design. The Venn range includes also brake pads for carbon rims, seatposts, carbon handlebars, bottle cages and carbon stems.